Many small business owners might encounter a big change — and possibly a big deduction — when they handle “pass-through income” under the new tax bill, a tax attorney told a Small Business Legislative Council webinar on Tuesday. Pass-through businesses are those where the owner pays taxes on the company’s income by declaring it on his or her own personal tax return rather than going through the corporate tax process, according to the Tax Foundation. About 90 percent of the companies in America are small businesses, including sole proprietorships, partnerships, and S-Corporations, according to the think tank. They’re different from C-Corporations, which according to the Tax Foundation would file an actual corporate tax return. C-Corporations saw their top tax rate slashed from 35 percent to 21 percent for the next 10 years, according to Wednesday’s webinar, which featured Paley Rothman principal Paula Calimafde and associate Jessica Summers. Unlike much of the bill, that C-Corp tax cut doesn’t sunset, Calimafde said. The rationale was that a C-Corporation needed consistency because it needed to plan for its future, which a skeptical Calimafde called “quite interesting” and mused that all taxpayers would probably appreciate the opportunity to plan as well. Pass-through business income in the past was levied at whatever personal tax bracket would be appropriate. The top personal bracket for the past tax year was 39.6 percent; the bill passed by Congress and signed by Republican President Donald Trump in December cuts that to 37 percent, according to the slides from Calimafde and Summers’ presentation. But the new bill also allows many pass-through business owners to deduct up to 20 percent of domestic “qualified business income,” and effectively pay a top marginal rate of 29.6 percent, according to the presentation slides. The deduction will apply to trusts and estates as well, Calimafde said. The presentation slides described qualified business income as “basically” the “net amount of income, gain, deduction and loss from an active trade or business within the US (with some exceptions) and not including reasonable compensation, any guaranteed payments or to the extent provided in regulations, payments to a partner for services under IRC Section 707(a).” Calimafde cautioned that this definition and basically every other element of her pass-through discussion had multiple exceptions. any trade or business involving the performance of services in the fields of health, law … accounting, actuarial science, performing arts, consulting, athletics, financial services, brokerage services, or any trade or business where the principal asset of such trade or business is the reputation or skill of 1 or more of its employees. It sounds like collision repairers wouldn’t count as a service business, but run that question and all elements of your business situation by your accountant and/or a qualified attorney before filing your taxes. Calimafde also suggested the calculator at www.leimbergservices.com/analyzers, though we should note it costs $139 a year. 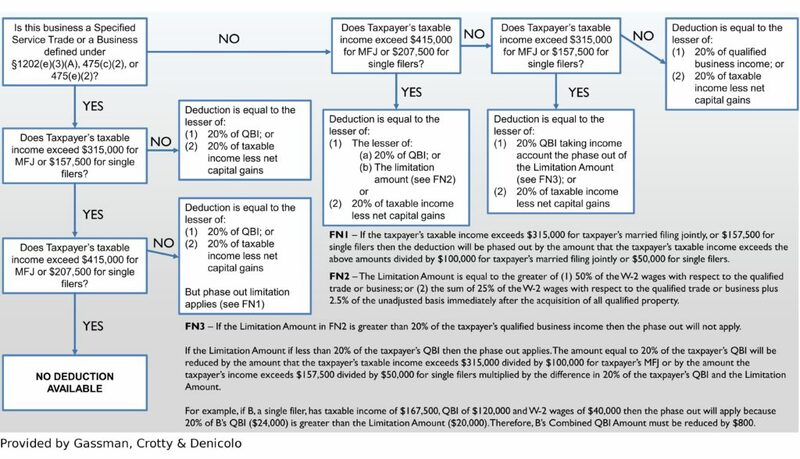 Aside from the service business question, the key variable for determining your deduction seems to be whether your pass-through income exceeds thresholds of either $415,000 or $315,000 for joint filers and $207,500 or $157,500 for single filers. Calimafde gave the audience a example of how pass-through taxation might work for a hypothetical married couple. The husband owns a non-service business and has $200,000 net qualified business income. The wife makes $50,000 at her job. As a married couple filing jointly, they take the standard deduction of $24,000 (an increased amount found in the new bill). That leaves the couple with $226,000 in taxable income. Under the bill, their deduction is the lesser of 20 percent of net business income or 20 percent of their taxable income. Therefore, their deduction is $40,000, and they owe taxes on $186,000. “This is really an accounting exercise,” Calimafde said of the pass-through deduction’s complexity, predicting that the Internal Revenue Service would generate 400 pages of regulations to explain and manage the deduction under the new bill. She said experts were already arguing over whether it was better for a business to be an S-Corp or a partnership under the new pass-through law. “The bottom line is that despite the complexity of this code section there is likely to be opportunities to take advantage of the deduction even though it appears at first that it won’t apply,” a slide stated, and Calimafde suggested some ways to do so. 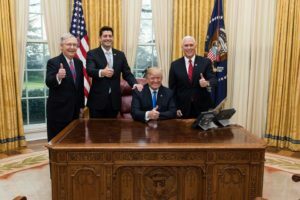 She encouraged small-business owners to ask a financial adviser if some employees should be made partial owners or the business should be restructured so that the owner might become eligible for a pass-through deduction. Another option might be to increase retirement contributions to lower the taxable income level to a point where the pass-through deduction kicks in, according to Calimafde. However, a concern exists that some owners might not save much for their retirement if their qualified business income falls below the $315,000/$157,500 limit, she said. “This is because the deduction for retirement plan contributions would be saving tax at the lower rate (QBI $$ with 20% deduction) but the funds coming out of the plan at a later date will be taxed at the regular individual tax rates (could be as high as 37%),” a slide stated.